The 4th edition of this textbook, now in full color, presents both general pathology and special pathology in one comprehensive resource. Coverage includes a brief review of basic principles related to anatomy, structure and function, followed by congenital and functional abnormalities and discussions of viral, bacterial, and parasitic infections and neoplasia. 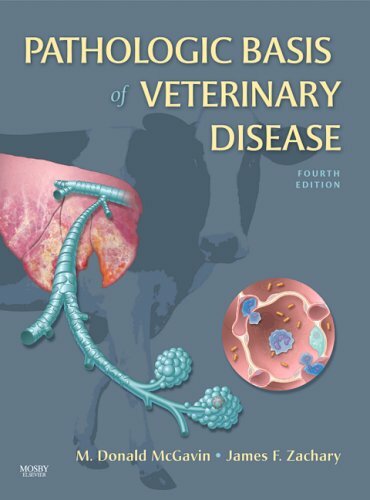 Logically organized chapters discuss normal functions of the body system, followed by pathologic conditions found in domestic and companion animals. While focusing primarily on diseases in North America, the text also includes pathologic conditions found in other parts of the world, as well as those being brought into this country, such as West Nile virus, through the importation of cattle, sheep, and other animals. Contributors are recognized in their area of expertise and are well known in research and education. Now in full color throughout with vivid new illustrations that clarify difficult concepts. Includes six new chapters covering general pathology that discuss topics such as cellular and tissue responses to injury, vascular disorders, inflammation, and tumor biology. All chapters emphasize mechanisms of disease (organ, tissue, cell, and molecular injury). Features sequential presentations of disease processes (portal of entry * target cells * cellular injury * visual appearance of injury * resolution of injury * clinical outcomes). Emphasizes portals of entry for microbes and injurious agents. Focuses on defense mechanisms against microbes and injurious agents.